Forget about curing your toenail fungus problem with Fungus Key Pro because it is a scam! This product is nothing but absolute nonsense from beginning to end … and in this short review you’ll find out why I said this. According to the unknown author of this program, Fungus Key Pro (aka Fungus Key Protocol) is the ‘Godsend’ to those with toenail fungus infection. It claims to base on a ‘natural’ method developed by a Vietnamese doctor named Wu Chang. Chang supposedly used the method to treat soldiers who were suffering from ‘jungle rot’ (toenail fungus) during the Vietnam war. Unsurprisingly, the unknown author never actually tells us what this ‘all natural’ method is and how it works. Instead, he focused on listing the side effects of current antifungal drugs like Lamisil (Terbinafine) and Sporanox (Itraconazole) in order to scare people into buying his product. 1. Wu Chang Does NOT Exist! Dr Wu Chang, the wonder medical inspiration behind Fungus Key Pro, does NOT exist! How do I know? 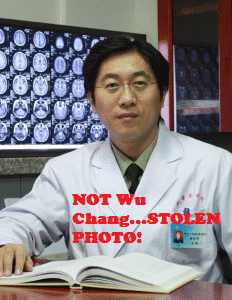 because the photo passed off as him is actually a stolen photo of a Chinese neurosurgeon named Yihua An! So don’t bother trying to find this ‘Wu Chang’ anywhere in the world, ‘cos he simply is not, and has never been here. Period. 2. Fake Testimonials with Paid Actors, Fake Facebook Profiles! All the featured video testimonials on Fungus Key Pro are fake. This is because they were done using actors from Fiverr.com, a marketplace where you can hire anybody to do anything for you for as little as $5! Take for example the middle-aged man calling himself ‘Matt Stephens.’ He is actually a popular Fiverr actor with the username ‘Banjoman.’ He has been featured in countless scams all over the internet, especially Forex and binary options scams. Head over to his Fiver page and pay him a cordial visit. In our case, Banjoman was paid $5 to lie on camera about the effectiveness of Fungus Key Pro. Believe me when I tell you that he has never used, and will never use the product! IMPORTANT TIP: Whenever you see a Fiverr.com actor endorsing a product, then know that that product is a SCAM! Final Conclusion: DON’T BUY Fungus Key Pro. It is A SCAM! This review is short, as there is nothing more to say about this product. So save your $37 and use it for something else. Also be sure to ignore the multiple pop-ups preventing you from leaving the site. Please know that Lamisil and Sporanox are still your best options for toenail fungus treatment if the topical antifungal creams do not work. Yes, they do have side effects and you do need to take them for a significant period of time, but they get the job done eventually. Again, you need a prescription from a doctor before you can use Lamisil or Sporanox. This means that the doctor will examine you first to see if you are at risk of developing the side effects before prescribing you the drug. Also know that the side effects are relatively rare and not as common as the Fungus Key Pro scammer wants you to believe. As always, feel free to use the comments section is=f you have any contribution to make. Thank you!